Games ~ Well go check it out! Only one so far, more coming soon. Cartoons ~ Only one cartoon so far but hopefully I'll find some more. Discography ~ So far this only has a few of the german releases on it, but not the current ones like the Winter Album or anything... yet! Merchandise ~ The german video entitled "We're 'N Sync" and more. Updated 8/22 with sheet music, summer '99 tour book, etc. Polls ~ Total of 6 polls right now. Chat ~ More AOL and other chats coming soon. Rosie ~ Pics from when the guys were on Rosie. Postcard ~ View the latest 'N Sync postcard (IDMC) and send one to your friends. Thinking of You ~ A few pics from the "Thinking of You" music video. The vids of IDMC and TOU are basically the same besides the first part, so it's as if these pics were of the IDMC one too. BMG Chat ~ Pics from the bmg chat they had awhile ago. For those of you that didn't go, it was pretty cool seeing as they had webcams set up. 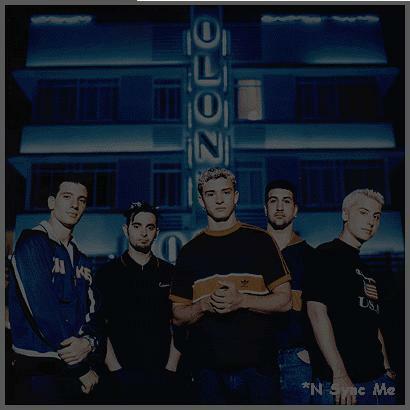 We're 'N Sync ~ Just a few pics from the german video and video cd entitled "We're 'N Sync." Magazine Shoots ~ Only Entertainment Weekly pics here so far, more on the way. Christmas Pics ~ Some Christmassy shots of the guys. Lyrics ~ Everything from their debut to their Winter album. Lyrics for Music of My Heart added 8/17 (sorry for the delay!). Chat Transcripts ~ Mostly Yahoo chats for now, new ones soon. Disney Christmas ~ Here are a few pics from the Very Merry Christmas Parade that Disney put on. Pics ~ General pics, some individual, many group shots. Group Pics ~ Here's a few group pics, but beware... it's very unorganized and stuff, so enter at your own risk! It might take a min. to load. JC Pics ~ Hmm... who do you think these pics are of? I know I gotta work out a better system for these pic pages (and I have a great one in mind!) but it'll hafta wait till I have a lil' free time. It is getting better by the moment, don't worry! Justin ~ Yet another page that I haven't had time to really fix up and everything, so you get the joy of viewing it all unorganized and without even an eighth of the pics it will soon have! IWYB ~ A lil' video clip of the guys performing iwyb at a walmart performance. Multimedia ~ Sound, video, all that stuff. Many more audio and video clips coming soon. Schedule ~ Includes upcoming tv appearances, chats and concerts. Links ~ Mostly official sites as of now, this section is under construction. Webrings ~ Different webrings I belong to. For those of you who haven't heard yet, *N Sync's new album entitled "No Strings Attached" is set to release November 16th. The group is also releasing a home video including studio footage of their new album being recorded and other behind the scenes footage. This video is set to be released September 28th. *N Sync's first single off their new album is titled "Music of My Heart" and will be released August 3rd. The song is performed with guest Gloria Estefan and featured on the soundtrack of the movie with the same title. The world premiere for this music video is August 10th on MTV. Haven't seen *N Sync's latest video yet? Then watch a little clip of it right now. (requires Realplayer) For those of you who haven't heard the song itself yet, here's a clip of the song. Please excuse the virtual dust, but this site is being renovated right now. I will try to keep it updated as much as possible while this process is going on, but everything will be back to normal once I finish the whole new well... everything! Thank you for your patience, sorry I can't update the normal stuff quite as often. Don't forget to vote for Music of My Heart now that it's been released! Let MTV know you still need your daily dose of 'N Sync. Please sign my guestbook! It only takes a minute, thank you. Please tell me what you thought of my site, it only takes a second. Thank you so much! I know you've all hear about Chris' clothing line FuManSkeeto due to come out this summer, well guess what! The FuManSkeeto website is finally up! Right now you can't purchase any of the designs, however you can view many of them (the pages do take awhile to load due to the graphics, but it's worth the wait). So check out Chris' independent project, FuManSkeeto. Yes it's true, you can now, for a limited time that is, buy actual, legal postage stamps with 'N Sync on them! The islands of St. Vincent and the Grenadines issued them on May 2nd. You must buy them by the sheet, and one sheet is $9.95. For more information visit the 'N Sync Stamps Website. So you missed the guys on Rosie May 12th? Who cares when you can see a clip of them performing right here and another right here! Or you might wanna check out the time they were on Rosie before that. You need quicktime to view these. This is almost 3MB, so it's gonna take a lil' while to load. Pics of the first time they were on Rosie are here too. Feel free to email me at nsyncme@att.net if you have any questions, comments, suggestions, or anything else at all! For instance I would love to hear from you if you happened to be at the August 19th concert at Irvine Meadows. And please, puuhleeease sign my guestbook! Most of the video clips here require Quicktime, so if you don't have it already you better download it. Here's an interview from when the guys were here at KIIS FM in Cali back in Jan. (Here's the old interview if you haven't heard it before.) You need realplayer for these.